Yesterday we learned the details of the banking royal commission, but whichever way our politicians spin it, the facts remain. Change must now come, and come soon. 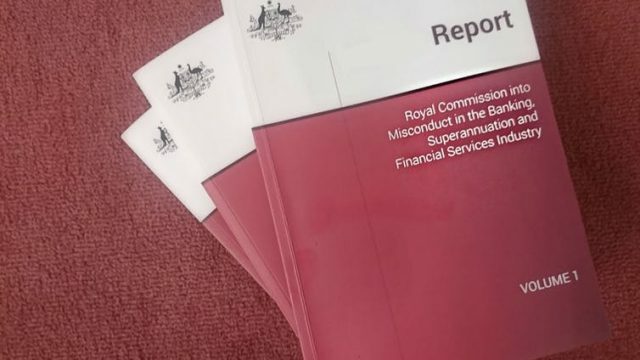 Treasurer Josh Frydenberg was glossing over history when he said the final report of the banking royal commission “endorsed many of the themes and individual reforms the government is currently pursuing”. In fact, on coming to office in late 2013, his government—through Finance Minister Mathias Cormann—did the opposite. Instead of extending provisions in the law that financial service providers act in the “best interests” of their clients, it tried to remove them, pressing Senate independents to have them excised from the at-the-time unimplemented Future of Financial Advice Act. It argued there would be greater certainty if advisers were merely required to fulfill a number of specific requirements rather than to act in the overall best interests of their clients. It’s a checklist approach Justice Kenneth Hayne dismisses, saying it has encouraged advisers to pursue a “good enough” outcome “instead of the best interests of the relevant clients or members”. What’s important is that the intent of the law is met, “rather than merely its terms complied with”. Hayne wants laws rewritten to draw explicit connections between their requirements and what they are trying to achieve. Such rewriting will make it clear that “exceptions and carve-outs like grandfathered commissions constitute a departure from applying the relevant fundamental norm”. The Coalition fought hard to allow financial advisers to continue to receive some grandfathered commissions—commissions their customers were signed up to before laws outlawing commissions came into place. Hayne wants all grandfathering to go “as soon as is reasonably practicable”. Hayne says in almost every case, bad conduct was driven not only by the firm’s pursuit of profit but also by individuals’ pursuit of gain… Frydenberg says he is taking action on all 76 recommendations. Frydenberg has agreed. From January 1, 2021 all grandfathering will go, and any previously grandfathered payments to advisers from clients’ accounts will be handed back to clients where they can reasonably be identified. Ongoing fees taken from clients’ accounts will need to be specifically reauthorised each year, a proposal neither the Coalition nor Labor put forward in negotiations over the Future of Financial Advice Act, settling on reauthorisation every two years in order to avoid paperwork. Frydenberg has accepted the recommendation, without a start date. Hayne wants all commissions to mortgage brokers banned so that the borrower, not the lender, pays the broker a fee. He wants the changes made over a period of two or three years, first by banning so-called annual trailing commissions that last the length of the loans, and then by banning upfront commissions. Frydenberg will ban trailing commissions from July 1, 2020 and will ask the Council of Financial Regulators and the Australian Competition and Consumer Commission to review in three years’ time the implications of moving to full consumer-pays. Hayne’s point is that buyers of financial products of all types often assume the person standing between them and the provider is acting in their interests. They need not be when they are being paid by the provider. The interests of client, intermediary and provider of a product or service are not only different, they are opposed. An intermediary who seeks to stand in “more than one canoe” cannot. Duty (to client) and (self) interest pull in opposite directions. Financial industry laws and regulations will apply more broadly than they have. Funeral insurance will no longer be exempted. Car dealers will face a limit on the fee they can get for selling add-on insurance. And retailers won’t be able to sell add-on insurance at the same time as the products themselves. Frydenberg said that people buying mobile phones were being sold screen insurance that cost more than the replacement of the screens. “Hawking”, unsolicited phone calls and pitches for superannuation and insurance and other products, will be prohibited. Lenders to farmers won’t be able to charge high default interest rates during droughts or when there is no realistic prospect of recovering the money. Banks won’t be able to offer overdrafts on basic accounts without the formal approval of the accounts’ owners, they won’t be able to charge dishonour fees on basic accounts, they will have to value agricultural land used as security for loans independently of the people who decide whether to grant the loans. Superannuation fund trustees won’t be able to work for other parts of the conglomerate that owns the fund giving them a conflict of interest, and trustees and directors will be subject to civil penalties if they fail to act in the fund members’ best interests. Each Australian will be defaulted into (“stapled” onto) only one superannuation account once at the beginning of their working life instead of into several as they change jobs as is required by awards and industrial agreements. The Productivity Commission estimated these multiple accounts cost super fund members A$10 billion per year in unnecessary fees. Australia’s much-criticised “twin peaks” model of regulation shared between the Australian Securities and Investments Commission and the Australian Prudential Regulation Authority will stay, although they will be subject to a new independent oversight body that will report on their performance every two years. They will also need to prepare and maintain a joint co-operation memorandum. In any investigation ASIC will have to have as a starting point the question of whether a case should be taken to court. Infringement notices should mainly be reserved for administrative rather than deliberate failings. Hayne says too often banks and other financial services entities that have broken the law have not been properly held to account. Misconduct will be deterred only if entities believe that misconduct will be detected, denounced and justly punished. Misconduct, especially misconduct that yields profit, is not deterred by requiring those who are found to have done wrong to do no more than pay compensation. And wrongdoing is not denounced by issuing a media release. He says in almost every case, bad conduct was driven not only by the firm’s pursuit of profit but also by individuals’ pursuit of gain. Providing a service to customers was relegated to second place. Sales became all important. Those who dealt with customers became sellers. And the confusion of roles extended well beyond front line service staff. Advisers became sellers and sellers became advisers. Rewarding misconduct is wrong. Yet incentive, bonus and commission schemes throughout the financial services industry have measured sales and profit, but not compliance with the law and proper standards. Rewards have been paid regardless of whether the person rewarded should have done what they did. Frydenberg says he is taking action on all 76 recommendations. He’ll set up an industry-funded compensation scheme able to payout over misconduct over the past ten years. And 24 specific acts of misconduct have been referred to authorities, covering every big financial firm other than Westpac. Peter Martin is Business and Economy Editor of The Conversation and a visiting fellow at the Crawford School of Public Policy at the ANU. A former Commonwealth Treasury official, he has worked as economics correspondent for ABC radio and as economics editor of The Age. With Dr Gigi Foster he created The Economists podcast on ABC RN. In 2016 he was made a Distinguished Alumni of Flinders University in recognition of his contribution to the community's understanding of economics. What happened to the $185 million wasted on Christmas Island?